Yesterday (Friday, September 29, 2017), several representatives from the Stockade neighborhood, including Stockade Association president Carol DeLaMater and Schenectady Heritage Foundation chair Gloria Kishton, met with Mayor Gary McCarthy, Operations Director Paul Lafond, and members of the Pump Station engineering and architectural design team to learn about the latest design of the North Ferry Street sewerage pump station project. In the meeting, they were told and shown that the new plan includes preservation of the Old Pump House, and that the NY State Historic Preservation Office (SHPO) is in fact requiring that the historic 1913 building be retained and reused. 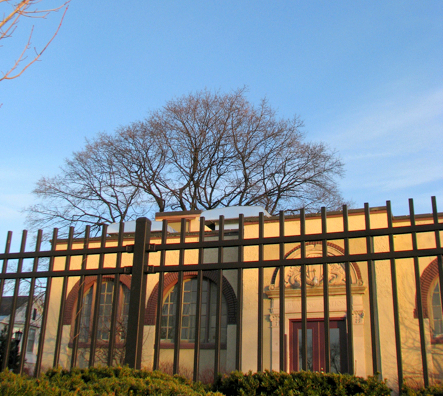 As recently as this Spring, I was told by a high-level City Hall official that the City had no plans or funds for maintaining or converting the Old Pump House, and that perhaps “preservationists” could find the necessary money. It appears, once again, that concerted effort by Stockade representatives and residents — fueled by passion, focused lobbying, and research — can turn around or motivate City Hall to protect important buildings and parks-capes, and listen to genuine neighborhood opinions. Of course, we also first need to be informed in a timely manner, to do our homework, and then to find people in the Administration and on City Council willing to listen with an open mind. Thanks are warranted to the core Stockade Pump House Gang (which also included Larry Schmidt, John Samultulski, and Suzy Unger), who “worked” the Mayor’s office, City Council members, SHPO, and others to help preserve an important part of the Stockade and Riverside Park scenery and history. Similarly, input from SHPO, and openness and flexibility on the part of the McCarthy Administration, Mike Miller and the CHA engineering and entire design team, and City Council are much appreciated. To me, it is a unique sight from the river and the park, beloved by many (some of whom do not even know what purpose it serves), and is a special structure from a time when industrial architecture had style. 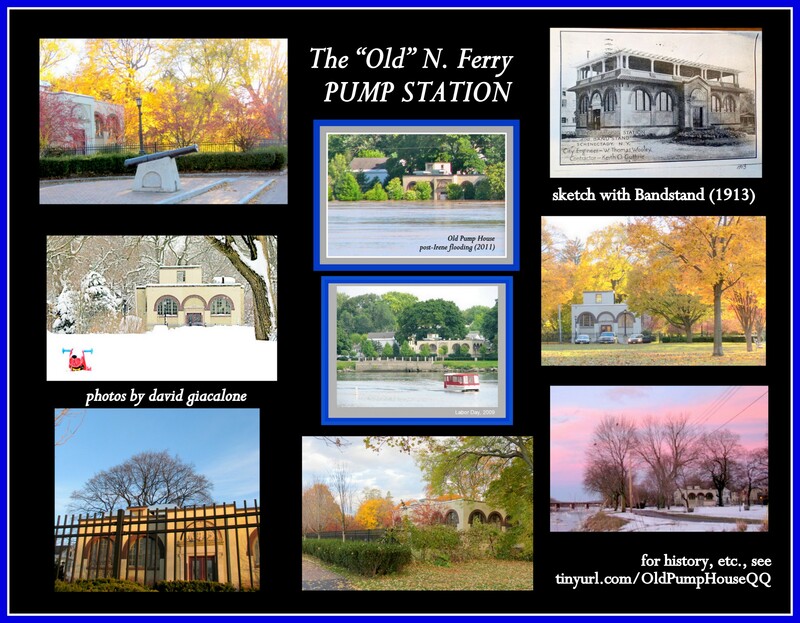 I also noted that “Some of my favorite photos include the old pump house.” This collage contains quite a few of them. Enjoy. Of course, Constant Vigilance is nonetheless a very helpful state of mind, and I am quite pleased we have that symbolic cannon to help protect the Old Pump House from future threats, whatever the source. Speaking of vigilance, and its handmaiden, public participation, the City will soon set a date for an Open House to be held in October to unveil the new pump station design, including a 3D model, present information, answer questions, and solicit input. 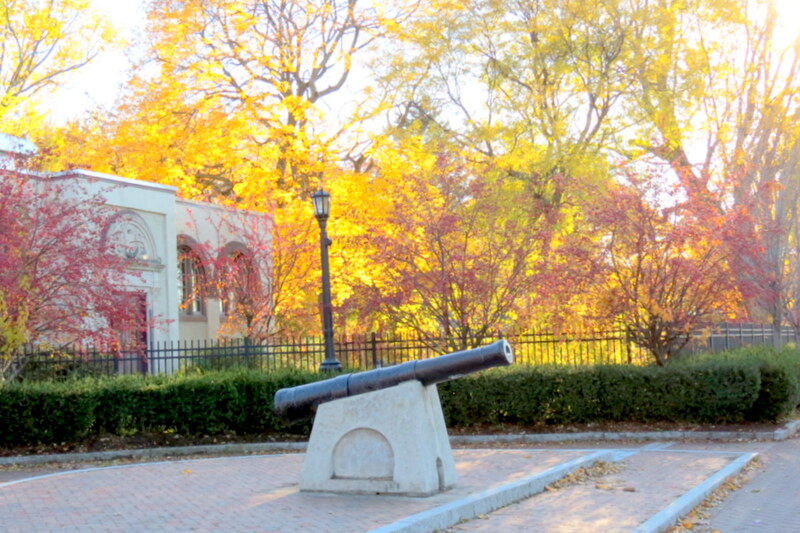 This entry was posted in news & press, Riverside Park by David Giacalone. Bookmark the permalink.